Because of its moderate climate, well-distributed rainfall, and wide variation of altitude and soil conditions, North Carolina has a relatively large number of grasses-some 360 species and varieties representing nearly all of the 14 or 15 known grass tribes. The largest areas of grasses, many noted by early writers such as Mark Catesby, John Lawson, John Brickell, and Moses Ashley Curtis, are found in coastal brackish marshes, old fields and deforested land, and mountain balds. Gerald McCarthy, a botanist with the North Carolina Agricultural Experiment Station, asserted in a 15 Oct. 1890 bulletin that southern states possess the soils and climate for growing many of the best grasses. Nearly three-fourths of North Carolina's grasses are native. Of the native grasses in the state, the largest number belongs to the tribe Paniceae. The most abundant coastal grass is smooth cordgrass, though other species such as sea oats and American beach grass also grow on dunes and sandy beaches. Wild rice or wild oats and Carolina canary grass are found along streams in the coastal plain. Broomsedges are the most abundant native grasses in the piedmont. Sedges, the most frequent species being mountain oat grass, dominate North Carolina mountain balds, which are a dense, lush green in summer and burnished gold in autumn. Other examples of grasses found on balds are red fescue and timothy grass. North Carolina grasses are very important for agriculture and the natural environment. Beyond their obvious agricultural applications as grain and hay and in pastures, grasses are used to provide watershed protection, retain or improve soil fertility and quality, prepare and stabilize soil, conserve soil and water, control erosion and runoff, decrease sedimentation in waterways, hasten dune formation, protect beaches and shorelines, and lessen or prevent pollution by decreasing the movement of pollutants such as pesticides into streams. Grasses are also used for lawns, golf courses, parks, and other recreational or aesthetic purposes. Researchers from North Carolina State University are studying the use of grass-already proven useful in removing such inorganic pollutants as fertilizers-as buffers near rivers and other bodies of water that may help eliminate contaminants from animal wastes. The fibrous root system of grasses helps to manage the nitrogen in soil and results in better soil tillage and water-holding capacity and healthier soil microorganism populations, including earthworms, rhizobia, and bacteria. After using fescue covers, farmers are able to increase their tobacco and corn crops, and a rye crop planted after a corn crop prevents nitrogen from leaching into water. Many North Carolina pastures need improvement, partially because farmers tend to keep out weeds and grass, avoiding combinations of grasses that might enrich the soil. 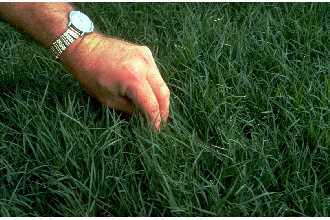 The best pasturage is found in the western part of the state, where Kentucky and Canada bluegrass, orchard grass, timothy, red top, fescues, and various species of Danthonia grow. The finest pastures of the coastal plain have bermuda, Dallis, and carpet grass. Hay is made from both wild and cultivated grasses. In mountain valleys it is mowed twice a year and includes red top, orchard grass, timothy, Kentucky and Canada bluegrass, meadow fescue, and tall oatgrass. On fallow land, orchard grass, meadow fescue, timothy, and clovers are used. The best piedmont meadows are cut two or three times a year, and broomsedges are the main grasses there. In the coastal plain, wild grasses for hay are scarce. Erosion is a serious threat in North Carolina, as it can cause the loss of tons of soil per acre of cropland and pastureland. Annuals such as crabgrasses and fescues and perennials such as bermuda grasses and broomsedges are used to conserve road shoulders. A problem to beaches, shorelines, waterfront property, and dunes, erosion may also be lessened by transplanting salt-marsh grasses, more effective and cheaper than building bulkheads or groins. H. L. Blomquist, The Grasses of North Carolina (1948). Douglas S. Chamblee, ed., The Production and Utilization of Pastures and Forages in North Carolina (1995). Harry Ellis, "High, Wide, and Handsome," Wildlife in North Carolina 61 (May 1997). "Moses A. Curtis." NC Highway Historical Marker G-64, NC Office of Archives & History: http://www.ncmarkers.com/Markers.aspx?sp=Markers&k=Markers&sv=G-64. Cynodon dactylon (Bermudagrass). Image courtesy of USDA. Available from http://plants.usda.gov/java/profile?symbol=CYDA (accessed December 3, 2012). 1 January 2006 | Shires, Nancy P.
I'd like to plant sedge grass in my yard. Unfortunately I have a Black Walnut tree overhanging this space, and as well I contend with several deer each day. Will sedge grow under this type of tree? Is sedge grass deer resistant? Weed grows to about 3-4 ft has a yellow flower(several). Ragged green leaves. Unfortunately, we are not able to answer your question about identifying a potential non-native species or whether or not it is detrimental. You have visited the NCpedia, the online encyclopedia of North Carolina, and while we have information and articles about our state's geography and plants, we are not able to answer specific scientific questions. You may also wish to contact the North Carolina Department of Environment and Natural Resourecs. They will be able to direct you to information about invasive species. Their contact information can be found on their website at http://portal.ncdenr.org/web/guest.